Our popular yard signs are still available. Help spread the word about the association by putting a yard sign in your lawn. Email info@prairiehillsna.org to request your sign. One side says “Get Involved in Your Community” and the other reads “Join the Prairie Hills Neighborhood Association” – both sides have our web address at the bottom. Where did they come from you ask? 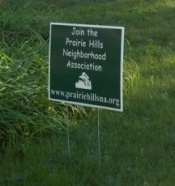 In the summer of 2007, the Prairie Hills Neighborhood Association received a $500 grant from the SW Planning Committee to help spread the word about the association. The signs were designed by Nicky & Christopher Morris and printed by FASTSIGNS in Madison.